The Friends of Heswall Dales Facebook page has been launched! It provides news and updates about the Dales, lets everyone know what the Friends are doing, and publicises any upcoming events. Follow the link above, or look for '@friendsofheswalldales' on Facebook. 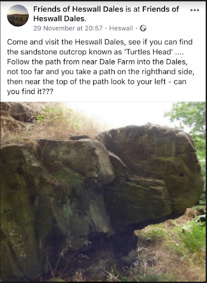 This new page helps us to promote the Dales to a much wider audience and to show Heswall Dales as a great place to visit including content of visitor experiences, and interesting information about the plants, birds, animals and features of the Dales….like the Turtle’s Head. It is also a great forum where you can let us know your views, and help to promote the Dales by sharing your photos and experiences – even if it just by 'checking in' to let people know you have visited. If you are not on Facebook don't worry: we will still be sending out our newsletters via the website and by email – but it might be worth a look – and if you have ideas or thoughts on how we can improve the Facebook page, or how to reach a wider audience - please contact aleinster@gmail.com. Alistair has recently joined the Friends committee and looks after our comms and publicity.